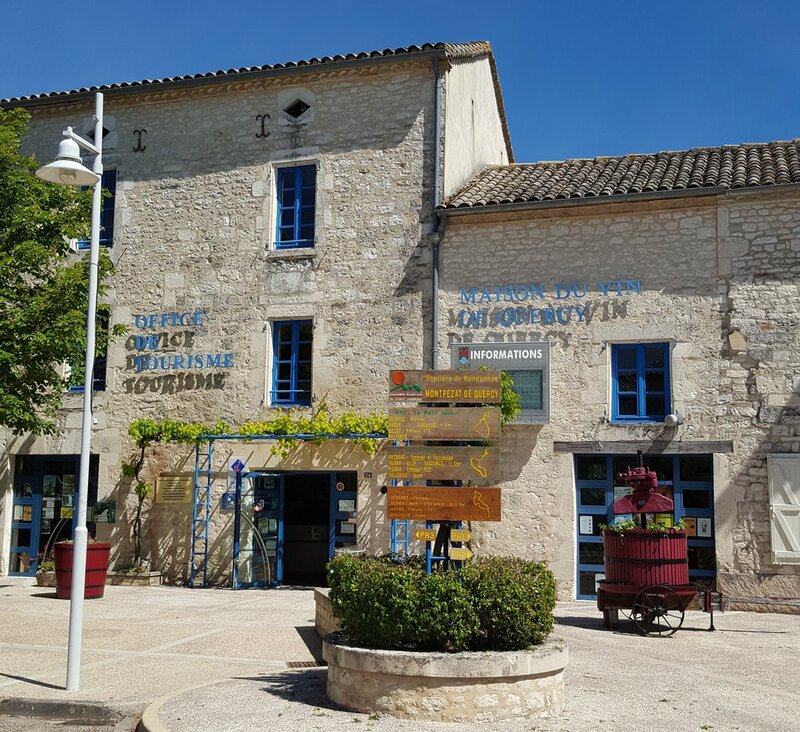 The medieval village of Montpezat de Quercy is to be found equidistant between Montauban and Cahors and is the first place you come to having crossed from the Lot into Tarn and Garonne on the pretty road from Castelnau Montratier. As you look over the patchwork of apple and plum orchards from the ramparts, on a clear day you can often glimpse the snow-covered peaks of the Pyrenees to the south and, unlike many bastide villages in this region, you don’t need crampons and an oxygen tank to benefit from these wonderful views. The village was sacked by the English during the 100 years’ war and suffered badly during 1939-45 when the Germans burnt 13 farms – sometimes with the occupants trapped inside – as a dry run for the atrocity enacted shortly afterwards at Oradour-sur-Glane. Possibly one of the smallest, but very moving, museums in France dedicated to both world wars can be found in a pigeoneer next to the school which is open in July and August. The first mention of Montpezat appears in the 7th century. The family Montpezat, ruled locally until 1250 after which they were accused of Cathar-heresy and were replaced by the Prés family. This family gave the town of Montpezat one of its great historical characters – Cardinal Pierre des Prés. Born in 1280, Pierre des Prés was the youngest in his family and his parents were anxious that he join the priesthood. He was called (aged 26) to the service of Pope John XXII (Jacques Duez, who was a native of Cahors) and during his lifetime he held many positions of high office and offered great loyalty to the Pope. He quickly became Vice-Chancellor of the Roman Church and led a distinguished career of over 45 years until he died of the plague in 1361. Pierre des Prés arranged for the construction of Montpezat’s best known building, the Saint Martin Collegiate Church. It is here that he is laid to rest in accordance with the terms of his will which stated: "Let my heart remain in Avignon and my body in Montpezat". The Flemish Tapestries – 5 drapes that have hung at the choir’s end of the Collegiate, since 1520. They depict the life and legend of St Martin of Tours. These tapestries have recently been returned to Belgium for restoration and are due to be re-hung in late June. The house of the Canons of the 15th and 17th centuries which is to be found behind the Collegiate. The village has retained its medieval appearance and has been well-maintained with its narrow-cobbled streets, corbelled brick houses and Gothic arcades supported by heavy stone pillars. Within the commune six further churches are to be found – all beautifully restored and cared for by the commune. The best of which is to be found hidden in the forest at Saux with its 14th century frescos. In the undulating countryside, mixed crop fields and cypress trees around Montpezat which is somewhat reminiscent of Tuscany, one can spot beautiful examples of white Quercy Blanc farmhouses and barns that stand out in their verdant surroundings and bear testimony this region’s rich agricultural heritage. The vibrancy of any French village in these parts can be measured in a number of ways: by its fetes, its associations, its church choir, its range of shops and restaurants, its school and whether or not it has a petrol station, a post office, a fire station, a bank, a pharmacy, a tourist office, a weekly market and so on. This may sound obvious but these provide the heartbeat of any community. However, financial pressures and the emergence of electronic banking and communications has led to many organisations questioning their presence in small outlying communities and, if one closes, others tend to follow which leads to a steady decline in the fortunes of those that remain. Unlike many villages that suffer from an aging and declining population, Montpezat can boast a population increase of over 10% over the past ten years as the availability and price of building land are attractive enough for the village both to retain and attract younger people from outside to move into the existing housing stock or to build new homes. Employment opportunities tend to be linked to the various retail or agricultural, fruit growing and wine-making sectors but there is some light industry and even a salmon smoking business. However, with the proximity of Cahors and Montauban, the inhabitants of Montpezat are content to commute to these cities where there are greater job possibilities whilst benefitting from the quality of life that comes from living in a rural community. Population growth within the commune means that the sustainability of shops, restaurants, the café and market is enhanced. The village can support not one but two doctors, two hairdressers, three garages, associations that attract more members which in turn lead a greater number of people that can be called upon to organise and participate in the various fêtes, vide greniers, marchés gourmands, repas dansants, sardinades, lottos, randonnes, etc. This ‘multiplier’ effect has led to Montpezat to continue to exist as a thriving commune and a shining example to other rural villages that are seeking ways to halt their decline. In recent years, in addition to the bi-annual Wine Festival, two new annual events have greatly enhanced the summer social calendar – Le Bleu Trompette, a jazz festival that takes place 19-22 July and the widely-acclaimed son et lumière on 14-18 August, Mairie des Brebis, in the tiny hamlet of Gandoulès. When added to the annual stage production in the village theatre in April and the multitude of concerts, exhibitions and lectures held throughout the year, the village also enjoys a rich array of cultural events. Also during July and August, the open air swimming pool and tennis court at La Faillel are open to everyone and there are Marchés Gourmands during the long summer evenings nearly every week where you can buy food and wine from the many traiteurs and domaines present and can join the locals at long trestle tables that have been set up on the tree-lined Avenue des Ecoles. For more information go to: https://tourisme-montpezat-de-quercy.com. In common with the Quercy region as a whole, the inhabitants of Montpezat are incredibly welcoming to outsiders and ex pats of all nationalities are made to feel welcome as integration into village life is made so simple – far more so than, say, if someone relocated to a village in the English countryside……. Speaking or trying to speak French undoubtedly helps, as does the use/employment of local artisans, regardless of nationality, as this keeps the money in le coin to the benefit of all.